Includes: All Locations, Decor, Photographers, Florists, Wedding Team, and Sample Menus. Minimum group size of 5 rooms. 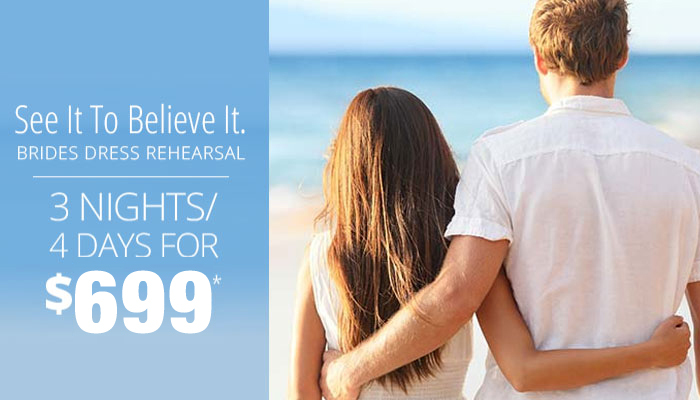 Includes: Free Room, Resort Credits, and more. 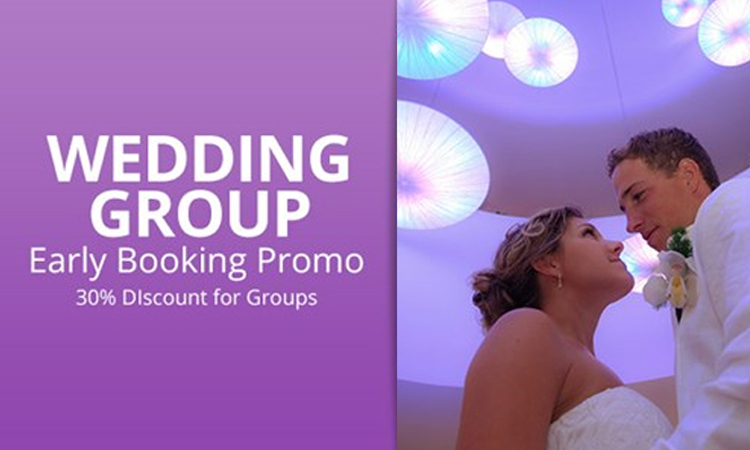 Includes: 30% Discount for Groups. The Memorable Moments Signature Wedding Collection™ by Karisma is influenced by designers but inspired by brides. It's a perfectly crafted recipe of high end inspiration, chic decor and Signature Accents™. Watch your destination wedding vision come to life while being treated to unparalleled service and a truly gourmet experience in the Riviera Maya. Receive your Always & Forever Complimentary* Wedding when you stay for 7 night or more and book a minimum of 5 rooms for 3 nights. Your Gourmet Inclusive™ Wedding Event starts with an Always and Forever FREE* wedding so you can start making memories that will last a lifetime. 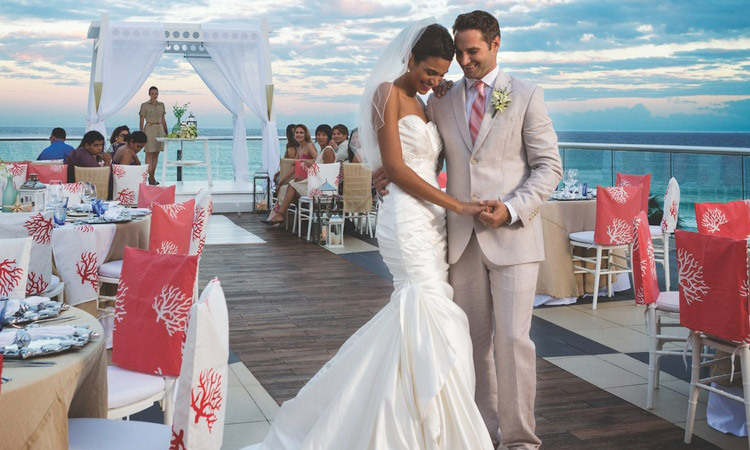 We have included all of the details in this complimentary* wedding package and the perfect Caribbean backdrop to take you from Always to Forever. *Always and Forever is complimentary in the North American market for wedding couples staying in a qualifying category for 7 nights or more and booking a minimum of 5 rooms for 3 nights (or 15 room nights minimum). Must qualify at least 45 days prior to ceremony date. For others, Always and Forever is available for purchase for $950USD for a symbolic ceremony and $1450USD for a legal ceremony. Other restrictions apply. Please refer to grid for more details. Always and Forever is also available to guests booking the Azul Villa Carola or Azul Villa Esmeralda for 4 nights or longer. Not valid at Azul Sensatori or Azul Fives in Canada. Not valid at Azul Beach Hotel except the month of September. Other restrictions may apply. See below or contact a Signature Wedding Designer for more information. *8 Only available in North American Market. Restrictions Apply. We invite you to be inspired and upgrade your Always and Forever FREE* wedding experience! Explore The Memorable Moments Signature Wedding Collection™ for stylish décor and special touches to make your Gourmet Inclusive Wedding Event nothing short of spectacular. You are on your way to an unforgettable event in paradise, and we are certain that your dream destination wedding will come to life right before your eyes. "Dreams really do come true. And I think to myself, what a wonderful world..."
A Contemporary Seaside Destination Wedding Celebration. There is even more to love... You selected your décor, and you are just getting started. Work with your Signature Wedding Designer™ and create the ceremony of your dreams, plan your events and add gourmet inclusive pairings, all topped off with special touches that are distinctly you. * Memorable Moments Signature Wedding Collection™ by Karisma not available at Azul Sensatori Jamaica. "You wear white and I'll wear out the words 'I love you' and you're beautiful..."
A City Chic Destination Wedding Affair. "Someone like you makes it all worthwhile..."
Experience the classic charm of this captivating setting in the Riviera Maya. Toast to your everlasting love while surrounded by fanciful features in a storybook scene that will be remembered forever. "Darling, so it goes, some things are meant to be." Old World Destination Wedding Fiesta. Find traditional Mexican wedding appeal complemented by sleek, trendy details in this exceptionally desirable collection. With an event like this, you are sure to make romantic memories never to be forgotten. "When you're cold, I'll be there, hold you tight. When you're low, I'll be there by your side baby..."
Discover the vibrant splendor of this rich collection that will sweep you and your guests off your feet. The beauty of this lush experience in the Riviera Maya will be rivaled only by the glory of your love. "You're my survival, you're my living proof. My love is alive..."
Encounter a dreamy atmosphere with shimmering hints in this lavish collection. This impressive wedding full of extravagant details will leave you and your guests breathless. Signature Wedding Designers™ - Your personal tour guide that will take you through every step of your wedding planning journey. Award Winning Resorts - Karisma has received top awards from Trip Advisor, Wine Spectator, Travel Weekly and more. With resorts as acclaimed as this, you cannot go wrong. Gourmet Inclusive™ Pairings - Karisma Hotels and Resorts specialize in exceptional cuisine and your event is no different. Add gourmet touches throughout your event that expresses your unique wedding palette. Exceptional Service - You'll have a helping hand anywhere you need it. With on-site wedding coordinators, a bridal attendant and a guest concierge, you are free to focus solely on celebrating your love! 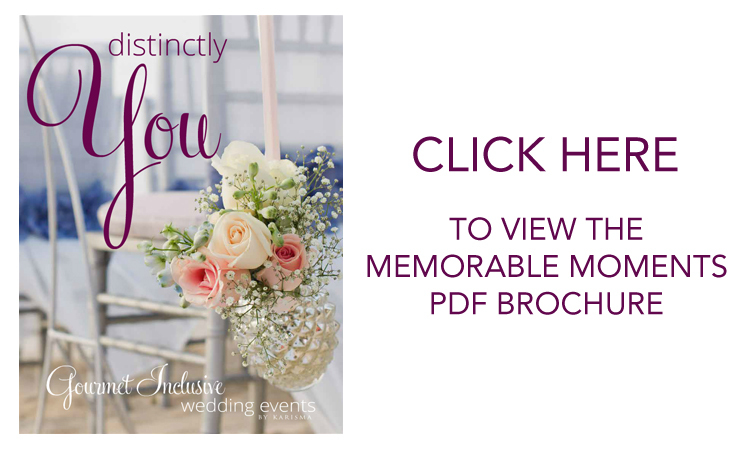 Distinctly You Design Event - Design the wedding of your dreams - just the way you want it. The options are endless and our Signature Wedding Designers™ will guide you every step of the way. Memorable Moments Signature Wedding Collection - Inspired by brides, influenced by designers we spent countless hours crafting six beautiful collections that are infused with just the right amount of Signature Accents and personal touches that reflect your unique personality.